Three years ago, I wrote a blog post on antlions, fantastic little creatures that live along the base of my house (and elsewhere in the world, I’m sure). I moved to a new house last year, and was happy to find antlion larvae living along its foundation too. I dug a few up the other day and brought them indoors for our family to watch (we have a praying mantis nymph in the house at the moment too). I’ll put them back outside soon. 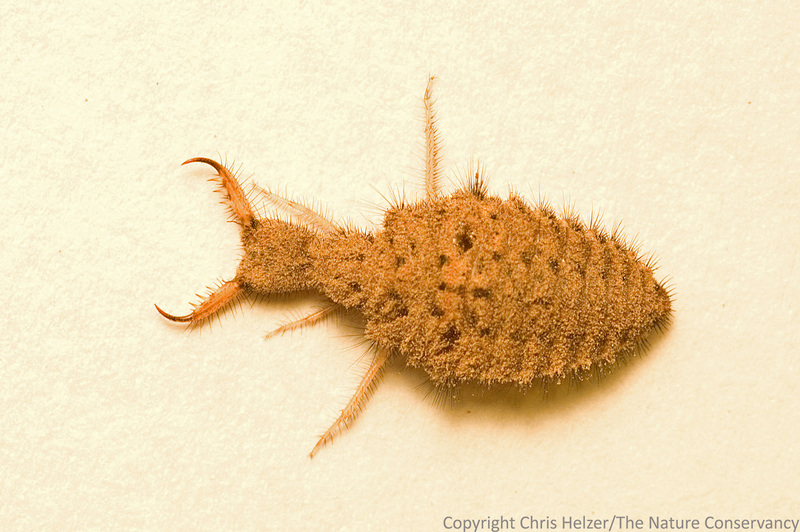 An antlion larva, a compact and efficient killer, with venomous mandibles for subduing prey and a muscular “neck” for tossing sand (and insect carcasses) out of its pit. In the video, you can see that one larva constructs a pit near the bottom left corner of the frame. Another larva makes a larger pit near the center. Near the bottom of the frame, a third antlion seems to start a pit, give up, wander over (and maybe through?) the smaller pit and then strike off toward the top of the frame and beyond. The larva in the small pit then begins repairs. I checked in on these larvae now and then while the camera was running, but never would have guessed there was that much action going on because it happened so gradually. Compressing time with the timelapse process was invaluable. It was also interesting how sporadically the action happened – as opposed to a fairly continuous excavation process.